Zeek Rewards – SEC Has SHUT IT DOWN! Website: previously www.zeekrewards.com That site is now disabled. Zeek Rewards, a Brief Look. Zeek Rewards was a program that allowed members to earn rewards through various programs including the purchase of special securities. They also had a very active affiliate program. However, the site has since been shut down with several different legal and ethical issues yet to be resolved. There was much backlash within the industry when this happened as there were many affiliates actively promoting this illegal Ponzi, many of whom had invested a considerable amount of money into promoting the program…money that was never recouped. The program was one of the 100 most popular websites in the world by the middle of 2012, but like any other Ponzi scam the rise and fall of a product like this is going to happen, it is just a matter of when. 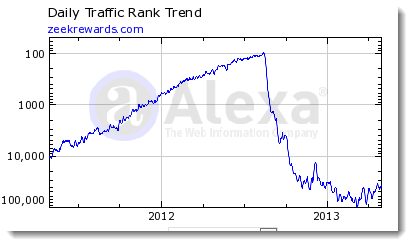 Here is the evidence of the rise and fall of ZeekRewards.com, based on their Alexa website traffic chart. On August 17, 2012, the SEC (Security and Exchange Commission) announced that Zeek Rewards was being shut down amid allegations of running a pyramid/Ponzi scheme that allegedly lured in over 1 million investors and became what the regulators have coined the “$600 million dollar Ponzi scheme”. Burks, who was the founder of the company, drew approximately $11 million out of the company during this amazing 20 month run but was required to give up his Texas-based company, Clifton Jolley, along with all of the assets. He was also required to pay a $4 million dollar penalty to the SEC. This is one of the most profound Internet Ponzi schemes ever created and it is amazing that 1 million people were sucked into this mess. Or is it? There are no pros: this site has been shut down and the owners are being investigated for varying counts of fraud by the SEC. The now defunct Zeek Rewards is being investigated by the Securities Exchange Commission for securities and trust fraud related to its business practices. Most experts are calling the former Zeek Rewards nothing but a Ponzi scheme which has scammed as much as $600 million dollars from former members. The former program had a Better Business Bureau score of F and had several outstanding reports filed on Ripoff Reports. The program no longer exists! Before it was shut down by the SEC, the program was designed to be used by over a million people. It consisted of two entities, ZeekRewards.com which was the “affiliate advertising” entity and the penny auction website Zeekler.com. Zeek Rewards was a program where you paid in at a set level and then made money by getting others to sign up under you. All of the “profits” made were then sent up the line to be distributed in varying amounts to the people below. It was nothing more than a well orchestrated pyramid scheme that fooled a massive group of folks into buying into the next big thing. The problem was that many of the people who joined did not understand how the full program worked and seemingly no one questioned the validity of the various securities that were being sold. In essence, the founder leveraged the idea that Zeek was going to be the next big thing and was able to accrue a massive following (a herd of unknowing victims) in the process. What Happened to All of the Zeek Rewards Folks? There was huge industry backlash after Zeek Rewards fell. People had a lot invested and had centered their entire businesses around the ZeekRewards platform. Like any other Ponzi, it was reliant on more people coming into the lower tiers to drive the earnings of the folks within the upper tiers and this all collapsed with one big gavel when the SEC laid down the law. Even after ZeekRewards was terminated by the SEC, the “upper tier” members were still advocating it as a legit program. They were defending it to the bitter end and they were so brainwashed into thinking it was legit (because they were making money doing it), that they were defending something that was proven legally to be scam! People get crazy when there is a bit of money on the table. Most of these folks have moved onto several programs structured in the style similar to that of a Ponzi and I have already seen some big backlash in the industry rooted from some of these systems. I hope for the sake of the folks out there that are unsuspecting that they don’t act like the lemmings that got trapped into thinking ZeekRewards was a real opportunity. It is reminiscent of the Bernie Madoff scheme but there is a bit less money involved and it targeted the affiliate marketing and MLM community on the Internet. If you are doing this and something feels “not right”, don’t DO IT. Your instinct is usually right and there are many scams within the online world (you can read about the top ones within the header of the site here). If you are researching a company and the first thing that you find is a notice that the Securities Exchange Commission has shut that company down, you know that there is some seriously unethical stuff going on. On August 17, 2012, the SEC announced that Zeek Rewards was being shut down amid allegations of running a pyramid/Ponzi scheme. Fraud charges were also filed at that time against the company, owner Paul Burks and the Rex Venture Group. The Internet is a safer place because of this move by the SEC, unfortunately the unscrupulous folks that were involved in this scam are still out there promoting the “next best thing” to others. If you look at the history of someone and you see they were heavily involved in ZeekRewards, you may want to avoid taking any advice from them and definitely DO NOT get sucked into anything they are promoting to you. Zeek Rewards, a Final Glance! Overall Rank: 0 out of 100 points. Do you have a personal review that you would like to add about Zeek Rewards (ripped off by chance)? If so, I would love to hear your personal experience of the the system and how it impacted the way you view the “opportunity” online. Thanks for taking the time to read this and I wish you all the success in the world! I “invested” $5000. I was coerced by my then boss and some higher up coworkers. Fortunately, it crashed within a month. I had signed up one person, but his check was still in my hand. I thank God I hadn’t turned it in. I also immediately filed my claim, and to date I have received $3750. I am hopeful I will receive the remaining $1250, but it looks like it will be next year. I feel for the coworkers of mine who had been in it long enough to receive dividends. They have to pay them back, and are being sued if they don’t. The meetings I went to weren’t shady people. They were pillars of the community and got sucked in to it like I did. Sorry to hear about this Craig and you obviously are aware that you are definitely not alone in losing money to the ZeekRewards scheme. So many others are in the same boat and it is great to hear that you were able to recover the $3,750 so far. Unfortunately there are many similar programs that are doing the exact same thing to people yet are flying under the radar. I can definitely appreciate that the folks that you were dealing with weren’t shady either, they often times aren’t. There exclusive partnerships and relationships (masterminds) behind these schemes that drive the growth and that is where the actual illegal structures stem thing. Once you are “in” these types of scams, often times it is hard to really see it from an outside view and realize what you are doing is taking money from people with the purpose of putting more money in your pocket…nothing more, nothing less. I invested the 5,000 also, and have received 3,750 back so far. I was very surprised to receive any money. I found the Zeek company to be very expedient in offering a refund. I just filled out all the information, and kept checking on the website. I’m hoping to receive the rest of my money by next year. I’m not sure why everyone is not receiving a refund, unless they did not fill out the proper paperwork. Great to hear you received some money back, it is more than most. It is unfortunate that companies like this ever get the opportunity to operate, but they continue to churn out under brand new names on the Internet today. My hope is that bringing programs like ZeekRewards amongst others to the limelight, there is going to be many different people that take more care and diligence before they join such a scheme. I really gotta give you a round of applause on this article, Kyle. It’s sad to say that my parents, aunt, friend’s mom and some neighbors all got tangled in this scam and when all of a sudden my dad wasn’t getting money anymore from them (basically when Zeek was shut down) I was left in the dark as to what was happening with the family finances. You, sir, have helped me a lot with just writing this, so thanks. So sorry to hear about this Tricia, your family members did not deserve this and I hope that they are not falling for the numerous scams that continue to pop up out there that are very similar in nature to the ponzi over at Zeek. A good percentage of the people from Zeek moved over the Empower Network and now are ripping people off over there. Glad I could offer perspective and perhaps in the future you should get your family to run their “ideas” by you first so you can help them make a logical decision. We never got a cent from them! and i have a list of all the ads my family and i posted in my penzu. Sorry to hear about this, but you are definitely not alone. There is a reason that this company was brought down by the SEC and I think there are some others that are soon going to be on their chopping block. Sorry to hear this Ramon, this has (as you know) been shut down by the SEC and I am glad to hear you were able to at least recoup some of the monies that you invested into this ponzi. Court order zeek have to pay back when is start pay back people form oversea??? ANYONE know please share the info with me. You will be lucky to receive any money from this Sunny, after litigation and fees, typically there is not a lot of money left to be paid out and unless you were involved in the actual process itself you might be out of luck. Learn from your mistakes though and avoid companies that put up a facade of being a “network marketing” company in this industry. There are far to many ponzis and scams out there with multi-level marketing structures where the product is promoting the product itself. Consider learning how to properly create a business online and you can accomplish this through education platforms like Wealthy Affiliate (you can get started for free there). Sunny…..I went into Zeek rewards ONE month before the SEC shut them down in August of 2012. I invested $5k at the beginning of July 2012. After the Ponzi scheme was identified, everyone who lost money was given the opportunity to file a claim with the receivership, Kenneth Bell, atty in Charlotte, NC. There was a September deadline….a deadline they seriously adhered to….for people who lost money and never made money….but if you didn’t file your claim before that deadline, you were finished. I filed my claim right away and so did my son and brother who invested the same amount as I. Our claims were accepted but we didn’t know what to expect. I have recouped all of my initial investment except for $1200, which didn’t hurt quite as badly as 5g. But the people who made money on Zeek….the D.O.J. went after them and they could either give it up, or be prosecuted and the judge wasn’t kidding. I think they did negotiate with some of the “winners” who came forth on their own. I’m not sure how many of the “winners” are left out there and I’m not sure if it’s over yet, but the courts didn’t mess around with Paul Burke. They jacked him up real good. He may do it again…probably will…..once a crook, always a crook…with very few exceptions. You could always email the receivership in Charlotte, NC and just ask if there is something they can do for you. The worst thing they can tell you is “no”….but nothing ventured, nothing gained! Go to the website that Kyle listed just below. I would like to know where to go and file a complaint or paper to claim my $300 and plus dollars from zeek company. Any advice? Hope this helps you out Aime. It seems like you and everyone else involved in the Zeek Ponzi. Now it is a matter of the monies being retrieved (what is left of it) and that will determine how much you can get back (if any). Just be careful going forward and I do recommend that you have a look at my “Legit Programs” section if you are looking to create a tangible business online. Hey, I invested in over $1,000’s into Zeek Reward. I am part of the class lawsuit against Zeek. I know it has been over a year since I filed my case. What do you think will happen once the receiver gets to my case #? Will I see all of my money; possibly more with this lawsuit or will I at most; get a fraction of what I’ve invested? You will get money if the result of the lawsuit goes in your favor (instead of Zeek Rewards founders) and if there is any money left…most of it might have vanished by now and you definitely won’t be getting back your entire $1,000’s, likely a percentage of this. Will we ever get some of our money back ? I filled out some paper work on line about two monthsago, have not heard anything. I hope for your sake you do James, but by the time it reaches the people that are part of class action lawsuit it will like be fractional of what you actually loss. Again, I hope you can recover some of your monies and do be careful going forward James when choosing the programs you associate with. Thank you for finally giving the facts about Empower Network. I finally went through and deleted every email that was from EN, or had anything to do with it. I told my husband when all of this started that I did not want anything to do with it. It has a feeling of being some kind of “cyber-cult”. Has nobody noticed that when people are holding up their checks, that David and David are making most of the profits? That is what makes this a pyramid scheme. There are very few people holding checks and it is always the same people getting on stage. One thing that many people don’t realize either is that those checks were created by taking money from others. I lost $ 3,000 to them in this ponzi. Paul Burks is a goddamn thief! Sorry to hear this Andre, I know you were not alone. People invested $100’s of millions into this scheme and ended out losing big in the end. The sad part? Many of these people behind the defrauding of folks have moved on to work within a new scheme. are u saying that the founders of empower network are the same guys who founded zeek. Empower Network, is a glorified gifting program, using easily copied marketing ideas and the guy that does the presentations is very vulgar and profane in his words and actions..not something you want to be part of, both ethically and morally. I have a feeling it will follow the same path that Zeek Rewards has. I know that there have been a myriad of complaints filed to the FTC over the Empower Network program and their unethical practices over the last couple of years. My very best friend is unfortunately getting scammed into joining Empower. She had mentioned it to me but I never gave it much thought until today when I listened to the training videos she got after spending $25 last night. I knew within the first minute it was a scam. I showed her a couple reviews but she already believes this crap. She told me how her sponsor spoke to her last night for over a half hour from Hawaii, how he had sent a dollar bill with a personal letter, how its not a pyramid scam, and get this how a 12 year old made $10,000 the first month. She is getting ready to go to their convention next month and I just am sick over this. I love her to death but no matter what I say she’s not buying it. Any ideas on how to save her from this scam? The only reason her sponsor is on the phone with here is because she is working for him in the level beneath him in the scheme. Not because he likes helping her, but because he wants her to push the scheme off on other folks and because he is going to want her to go “all in”. I can assure you the next step is going to be him telling her that she needs to buy the payment processor ($19.95 per month). There is no other affiliate company or MLM that I am aware of that charges you to get paid. The reason this is in place is because no merchant account or legitimate bank (including Paypal) would ever touch a scheme like this as they would be liable for any of the transactions that would take place and if the FTC ever stepped in, they would be in big trouble. BUT, that is just the start of the payments she is going to outlay. She is then going to be told to buy the $100 per month inner circle as it is training she apparently “needs”, then the high ticket courses that are $500 one time, $1,000 one time and there is even a $3,500 retreat…outside of all the conference costs. Before you know it your friend is going to be out a lot of money because here SPONSOR wants her to buy all of this stuff because he is going to get all of her money. If you are like any sane human being (which it sounds like you have a good head on your shoulders), this is one big scheme. I hope you can wake your friend up to this before it is to late. Nice article Kyle, I have never heard of Zeek Rewards until I read this.It’s always great news to hear when another pyramid scheme gets shut down for scamming millions of people. Hopefully the Empower Network are the next ones to go. You can only run an illegal business for so long before it catches up with you and they shut you down. Thanks for informing us about this scam. Yeah, these sorts of schemes tend to only last so long until they get recognized or called out on their ponzi style structuring. The problem resides in the fact that people are “told” to believe in it and if they don’t, they are shunned and called ridiculous (with no explanation). I can still remember the rah rah sessions behind the Zeek audience and knew that is was going to be just a matter of time before the stones came tumbling down. Thanks for your feedback Scott, much appreciated! 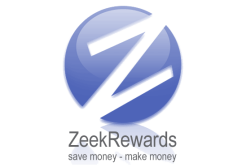 Have you heard anything about the zeek rewards receivership. From what I was told is that you can apply to get some of your investment back from the courts. Yes, this has been going on for some time. There are MANY folks that lost a significant amount of time and money to the Zeek Rewards program (unfortunately) and I do hope that some of them will get their investments back. One thing that I don’t agree with is that many folks were “mad” about Zeek getting shut down moved over to the next closest schemes, including the likes of Rippln and Empower Network. I guess they never learn. Great review, I can not believe for it to end, I was going to fall in anchio network zeek rewards, but fortunately something held me back .. Unfortunately, I fell into the empower network, but not for long .. I did just a month .. after that, something bothered me and I closed everything. I will not go into the merits, but I think this system and another ponzi .. as you rightly say. Thanks for your feedback Anthony and I am glad you went with your get. As I said in the post, if it doesn’t feel right it probably isn’t. Unfortunately too many folks lose this oversight because they make a few bucks and then they put on the blinders to logic an ethics in effort to make more money. This is how the vicious cycle of unethical Ponzi’s continues and my hopes are that programs like ZeekRewards don’t continue to spin off as it seems they are these days. If you ever do need help getting a business up and running, I can definitely help you out and I do recommend that you check out the following process on “how earning revenue online” actually works. Take it easy! I had a very successful business people get so excited about this ZeekRewards company. They were sure it would pay huge rewards. They were so sure it was going to be a big success, they were sending me money to get started. The company was shut down about 2-3 days afterwards. I am so glad that I did not jump on that one and they are probably glad the mail system was slow that week or they would have lost even more than they did. Sounds like it was good timing Bo and fortunately you didn’t get too deep into this Ponzi before you lost too much money and you were convinced that “this was the way”. I know a lot of folks were really committed to promoting the program at ZeekRewards and like most other scams, they felt it was OK because they were making money. I see this happening all over again as many of the “top” folks at ZeekRewards have moved their businesses over to the next best thing, Empower Network. It is a sad state the world is in when people feel they have to take money from others in attempt to earn money for themselves (instead of the typical customer/product/service exchange). Hopefully with time and as Google and SEC continues to punish companies like this the Internet will become a more ethical place to hang out. It always amazes me that after guys like Madoff and others duped so many people that companies like Zeek rewards still have the audacity to be pulling ponzi schemes. Just goes to show we still need to do our research before we join these companies. Great article Kyle! I hear you Dwayne and often times research cannot be trusted as there are usually large groups of folks behind a Ponzi pushing the legitimacy of it (obviously with the sole effort of making more more). There are ethical ways to make money in this world and being involved within Ponzi style programs or MLM’s without an actual product being sold to the outside public (not just within the actual levels) is not one of them. That is exactly what folks of ZeekRewards were saying…even after the SEC terminated the company and laid down many fines and fraud charges to Paul Burks. Yet the Zeekers were still adiment that it was legit. Why is this? Here is the definition for Ponzi Scheme once again. If you are not paid by subsequent investors into the program you are involved with, then I will believe you that you are not involved in a Ponzi. However, if you require other “investors” to join under you in order to get paid and in order to earn a profit, then you might want to do a bit of research and create a sense of clarity as to what you are doing. I reference programs that are “much like” a Ponzi scheme one just to offer some insights to folks before the decide to get into something or fooled into a program that may not be as legitimate as it comes off to be. This is much different from a legitimate MLM product and there are many of these out there.